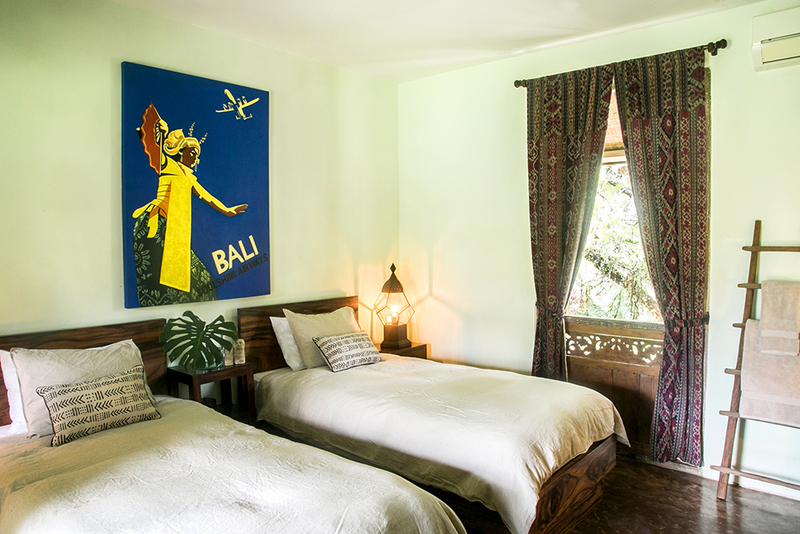 Includes: Lodging in a sharing double room at Soulshine Bali Ubud, breakfast, dinners, bike tour, balinese cooking class, typical dance dinner-show and two daily yoga / meditation sessions. Experience your inner vibrance on this sublime island! Immerse yourself in Bali: yoga sessions surrounded by rice paddies, flow in the temples and ceremonies, walk in the monkey-forest sanctuary, be amazed by Kecak ritual dance, smile back at friendly locals and chill out it Ubud’s cafes. But wherever you travel in Bali, the real blessing is in just being present and finding your own path. Bali is one of the 17,000 islands in Indonesia, and the only one where Hinduism is the main religion so it plays a huge part in its open and welcome feeling: you immediately notice how important their religion is to the Balinese in day to day Life. Bali’s landscapes, cultural heritage, people, beaches, music and food holds mysteries for you to explore. Yogi and explorer. He is yoga instructor certified by the 3HO organization of Kundalini Yoga since 2006 in Barcelons, Sapin. He is passionate about traveling, nature, yoga and everything related to wellness. Federico created Omm Retreats, a space where his work as tour manager and yoga instructor converge, promoting yoga retreats in nature, creating a more complete and enriching experience. We will be staying at Soulshine Bali, a retreat oasis nestled between stunning rice field terraces of the village of Ubud. Soulshine offers a truly unique experience mixing the comforts of home, the community feel of an ashram, and the personal touch of a boutique hotel with an open-air yoga studio with breathtaking 360 degree views. Once in Soulshine you can walk to Durga Temple through the rice fields, experience a traditional Balinese massage, spash in it’s endless swimming pool, chat with the friendly staff, plan an excursion, or indulge your self in it’s exquisite culinary delights. The perfect place to re-connect and unwind! SOUL ROOMS: Deluxe rooms with a/c and built in wardrobes. Two single beds or one queen size available in each room. All rooms have garden view. Each floor of the two story building have their own bathrooms (outside the room) with two wash basins, showers and toilets. Early bird Price: Starting from $1,700 USD per person. Sharing double room. BOUTIQUE SUITES: Deluxe rooms with a/c and built in wardrobes, hand crafted furniture by local artisans. One King size bed in each suite. En suite bathroom. Tons of space. Great views. Early Bird Price: Starting from $2,000 USD per person. Sharing double room. POOL SUITES: Luxury suites with a/c and built in wardrobes. The ultimate luxury bungalow with a plunge pool enclosed with lush tropical greenery. 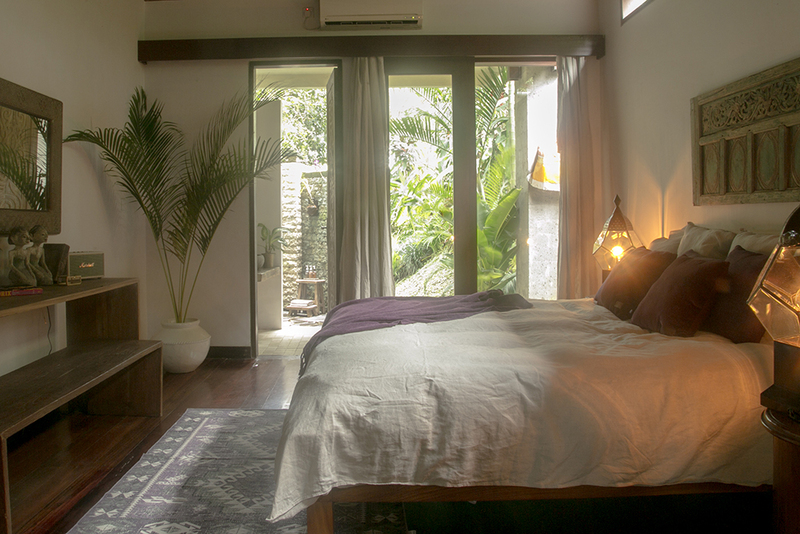 Wake up to a Jungle view from your super comfy bed and spin vinyls on your own record player. After watching the sunset on the roof top you can take a bath. This is truly a place to lay back and relax. Early Bird Price: Starting from $2,775 USD per person. Sharing double room. We’ll wake up with the sunrise and start the day with a Yoga session especially designed for the morning – to open and strengthen the muscles, tune in to the breath and connect with our own body and mind. By 9am we’ll be ready for our delicious and healthy buffet breakfast next to the swimming pool. After this comes free time! 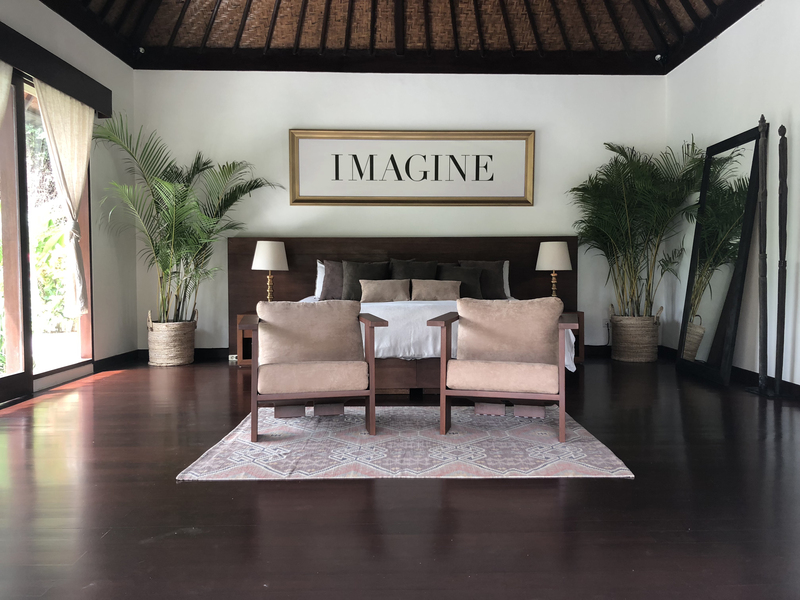 Enjoy space for yourself to walk through the rice fields, explore Ubud town, rent a moped, enjoy a massage, book a tour / cooking class, or simply relax, rest and be. At 5:30pm we’ll get ready for our evening Mindfulness Meditation session. As the week progresses, we will also integrate elements of Yoga philosophy and mindfulness practice, to provide you with positive new understandings to benefit to your daily life back home. At around 8:00pm prepare for dinner – an exquisite Balinese style buffet done with tons of love and fresh products. Enjoy, rest and repeat! Bike excursion: In this down hill Bali countryside cycling we will be taken to the top of a volcano and then easily go downhill enjoying the quiet countryside of Bali’s back roads witnessing first-hand the daily life of rural life with an in depth explanations of the culture. Balinese cooking class: Discover the secrets of Balinese food with Janet DeNeefe and her team. We will explore cooking techniques and the fascinating kitchen myths of this unique culture followed by a lavish Balinese feast and complete recipes. Authentic Balinese dance show: One night we will be amazed by this dance. We will visit an authentic Balinese home and after the traditional dinner we will enjoy one of symbols of this magical island: the legong dance. As well, during the bali yoga retreat, you will have plenty of down time to allow you to relax in the villa, explore on your own the town of Ubud, rent a motorbike, take an optional excursion to other parts of the island or just enjoy the massage sessions at Soulshine. ARRIVAL FLIGHT: Please fly into Denpasar Airport (Bali). You can also arrive a night before and enjoy Ubud until the retreat starts, we will help you find a nice accommodation. DEPARTURE FLIGHT: We suggest staying in Bali and explore the island for a few days hiking in the north hills or snorkeling at Gili islands. TRANSPORTATION: Transfers are included via private transport on the arrival and departure days. If you have any questions regarding your arrival time and transportation availability, please contact us. No, unless you want to stay for more than 30 days in Indonesia. Bali utilizes the standard European plug (two round pins) and is at 230V. Adapters will be necessary if you are taking any electrical items. Is there internet access on property? Yes, free wi-fi on property. Because of it’s equatorial location, Bali tends to have fairly stable weather with the ‘wet’ season occurring between October and April and the ‘dry’ season between May and September. It is generally always hot with temperatures hovering in the mid to high 80s (25ºc) and up. Can I book an optional excursion? Extra excursions (Like an island temple tour, Beach day, SPA treatments…) can be booked at the retreat at any time during your stay. Where can I have lunch? How about Payment and Cancellation Policy? You can pay for the full retreat or make a $500 USD deposit per person (non-refundable). Once we receive your deposit your booking is confirmed and you will get a receipt. Payment methods: Credit Card and Paypal thru our web page. For bank wire transfer please contact us and we will forward our bank account coordinates to you. If you cancel more than 90 days before your date of arrival you will forfeit your $500 USD deposit, and the rest of your payment may be applied to another Omm Retreats trip. If you cancel 60 – 89 days before your date of arrival, 75% of your payment may be applied to another Omm Retreats trip. You will forfeit your $500 USD deposit. If you cancel 31 – 59 days before your date of arrival, 40% of your payment may be applied to another Omm Retreats trip. You will forfeit your $500 USD deposit. If you cancel 30 days or less before your date of arrival, you will forfeit 100% of your payment (or you can transfer your place to somebody). This trip is perfect for all levels of yoga experience. All ages. Come solo, as a couple or with friends. Stay in a single or double- occupancy.